The world's finest loudspeaker manufacturer, Bowers and Wilkins (B&W), is launching what's widely expected to be the world's finest iPod dock in early 2008. The striking Zeppelin (see photo) is like nothing else on the market and features a five-speaker compliment, backed by 100 watts of high-quality amplification. 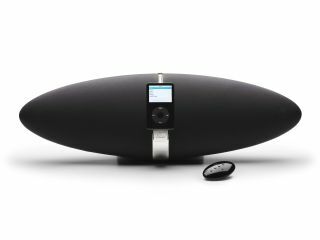 The Zeppelin will fall into the 'luxury' end of the iPod dock market and is said to offer "audiophile performance" - and let's face it, when has B&W ever let us down? It has been designed with the audiophile in mind, too: the Zeppelin has been described as offering "excellent stereo imaging" as well as "real" bass extension. Already on sale in the US, Zeppelin is the result of a joint engineering project between B&W's Sussex-and-Montreal-based R&D teams and famed industrial designer Morten Warren and his Native design studio. Designed to have 360° visual appeal, the dock is the first integrated iPod dock from the brand in its history. Zeppelin is said to be simple to operate: users can simply drop their iPods in and press play. Volume can be adjusted on the unit itself, on the iPod, or on the supplied remote control. The UK price is expected to be £400.